Gov. Rameshwar Thakur recently left Bangalore as Governor of Karnataka to take up position as the Governor of MP. He bid an emotional adieu saying Bangalore is a great city and full of intellectuals. How, timely comes his observation - our own IT mannina maga (ie., IT son of the soil!!) 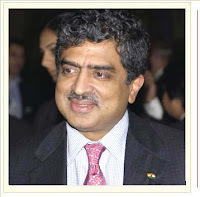 - Padmabhushan Nandan Nilekani, the billionaire IT czar & Co-Chairman of Infosys, takes up a super national Governmental position as Chairman of Unique Identification Authority of India. It is truly a great honor to a fellow Bangalorean. He will enjoy the status of Cabinet Minister of Union Govt. This move engineered by our PM - Mr. Manmohan Singh, reflects the quality of intellectual climate and people of Bangalore and Karnataka, as opined by the honorable outgoing Governor - Rameshwar Thakur. What does the Unique Identification Number Project mean to India? The purpose of this Rs. 100 crores project (Rs. 100 crores is the outlay in the interim budget of 2009 - 2010) is to give every Indian an unique identification number. This would mean harnessing all the conceptual strengths of Nandan Nilekani and his grip on the IT science to create an infrastructure that will electronically document the profile of a citizen and give him a number. This number will in turn be a key for obtaining various Governmental services. From what we understand of Nandan Nilekani one can expect a superb job done of this project. One can also expect something that Infosys always does: UNDER PROMISE AND BETTER DELIVER! So Nandan will surely do something far more than expected from this project. Nandan is a true patriot. His sincere love for India is reflected in his book IMAGINING INDIA (click here). It is this sincere love for India that has made him give up his relatively comfortable corporate job of Co-Chairman of Infosys to becoming a Govt. person. Otherwise, there is no need for this man to give up his relatively cushy job in Bangalore and go over to Delhi, roll up his sleeves, and work for what can always become a thankless task if politicking rears up its ugly head (I bet there are many vested interests in politics who want this project to go on very very slowly). Can this project translate in to something better on the healthcare front? We are as yet not sure what info the project will gather about a person - besides his date of birth, place of birth, gender, caste, economic status, etc. Analytics is basically a science of analyzing data of say people, events and circumstances and providing a visual representation of the same for refined decision making. Statistical science is used in analytics. Thus, using analytics one can find the regions where for eg., anemia is more prevalent. Marketers and policy planners can launch specific marketing programs to alleviate this problem. This is but one hypothetical application of the unique identification number project. Let us say that the analytics exercise also provides leads to places where infant mortality, and preterm deliveries are more. Then healthcare planners and marketers can launch product marketing programs in such districts to improve prenatal care. Basically the dialog should begin now so that healthcare data mining gets embedded in to the genetic code of the Unique Identification Number Project. This input will then provide a great boost to the healthcare policies of India and provide impetus to marketing programs of pharma marketers. Mr. Nandan - it is truly a great sacrifice - going away from Infosys to a Govt. of India job. To take on a bull by its horns... BEST OF LUCK!! And hats off to your family and close well wishers (including the large hearted Infoscians, after all Infosys as a company is losing services of its charismatic cofounder leader) who are supporting you on this move. Thanks for reading this blogpost, please do scroll down to read all other blogposts, click on older posts wherever required, please inform your acquaintances of this blog.